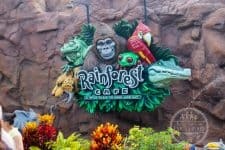 Counting down to your next Walt Disney World vacation can be just as fun as the vacation itself. 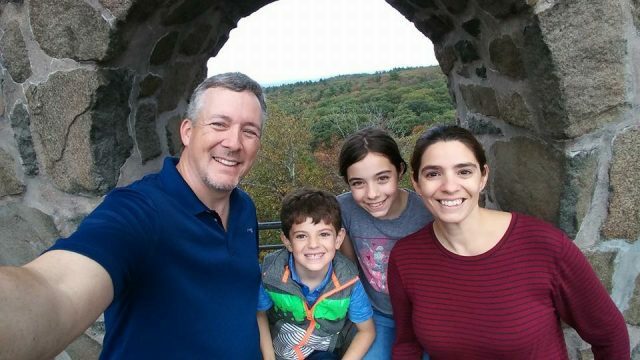 In my family, when we have a vacation booked, we make the days leading up to it extra special. One of the things we love to do is make a countdown chart. The kids get a kick out of marking off the days. 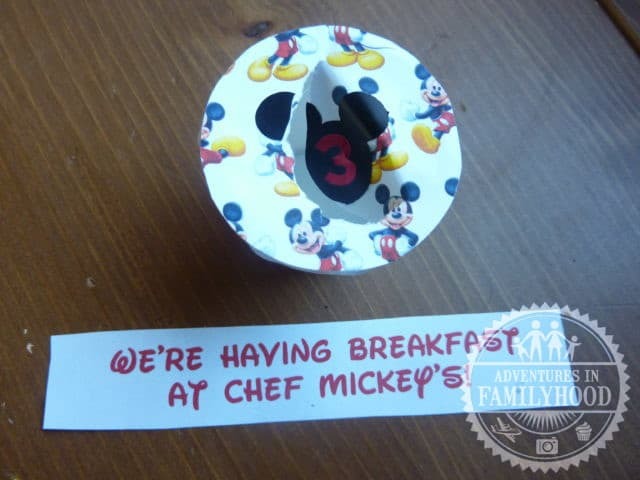 Over the years, we’ve used paper chains, dry erase boards and stickers as ways to countdown to our vacation. But now, I’ve come up with an even better chart. My favorite kind of crafts are ones that can be made from recycled materials. This craft put my old, used k-cups to good use. I created a 2-week countdown chart using 14 k-cups. Inside each cup is a note that will tell my family something special we will do on our next vacation. Not only was this craft inexpensive and easy to do, it could be used over and over again. Once you decide to make this chart, start collecting k-cups. As the only coffee drinker in my family, it took me some time to have a good collection. When you have enough, clean each cup. Start by peeling off the seal. You’ll then have to pull out the filter. This is the hardest part, but try to get as much of the filter out as possible. Wash and dry the inside of each cup. 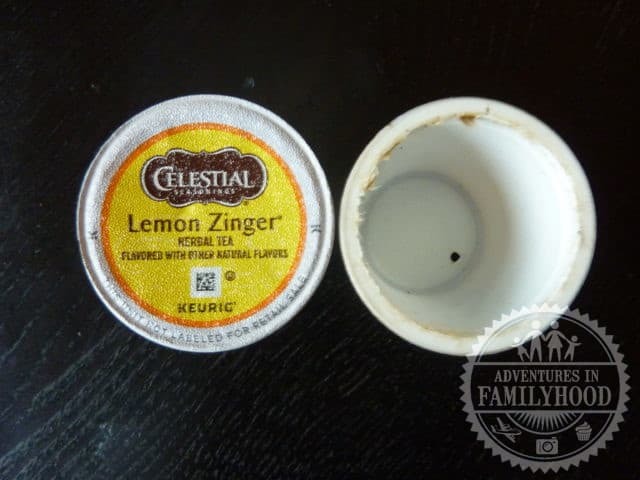 Fill each k-cup with the slip of paper. Set them aside. Using a k-cup as a pattern, trace 14 circles on the backside of the scrapbook paper. Cut them out. 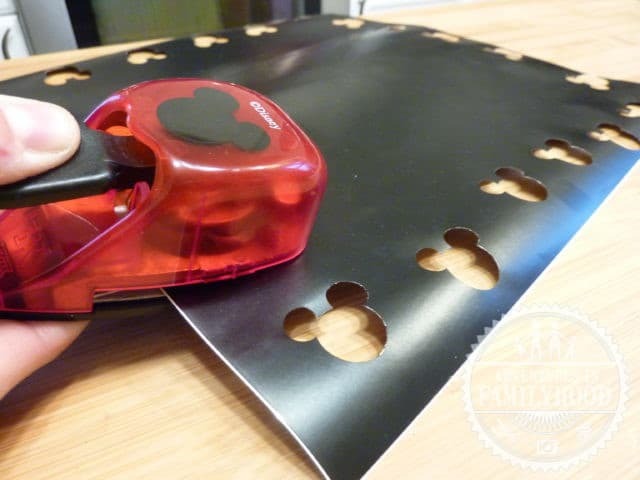 You could also use a paper cutting machine for this step. 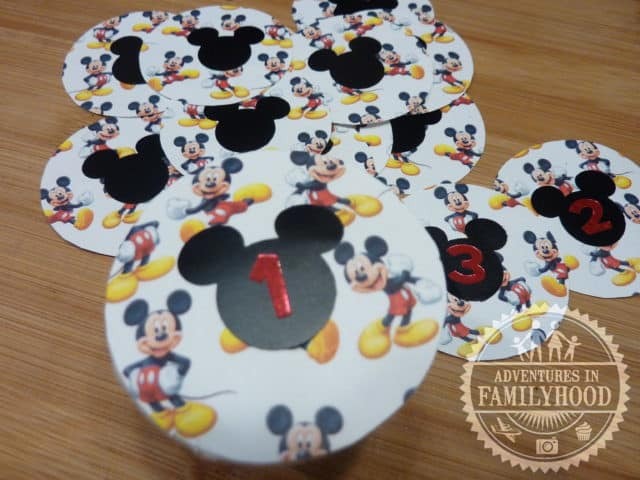 Punch 14 Mickey heads using the Mickey shaped punch. Place one on each circle. In the middle of the Mickey head, put a number. 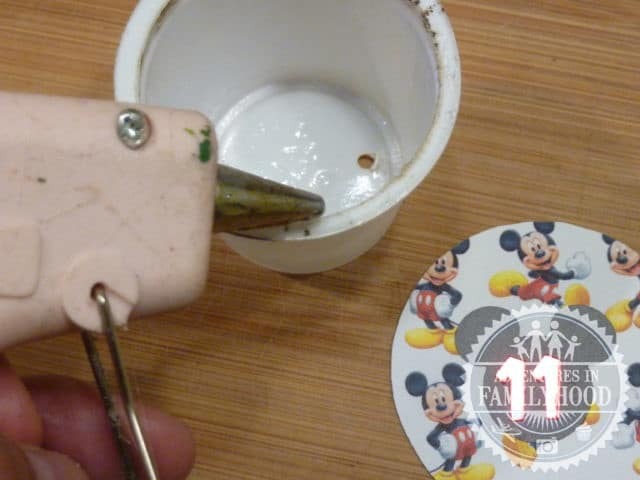 Place a thin layer of hot glue around the rim of a cup. Put the circle on top and seal. Repeat this step with the rest of the cups. 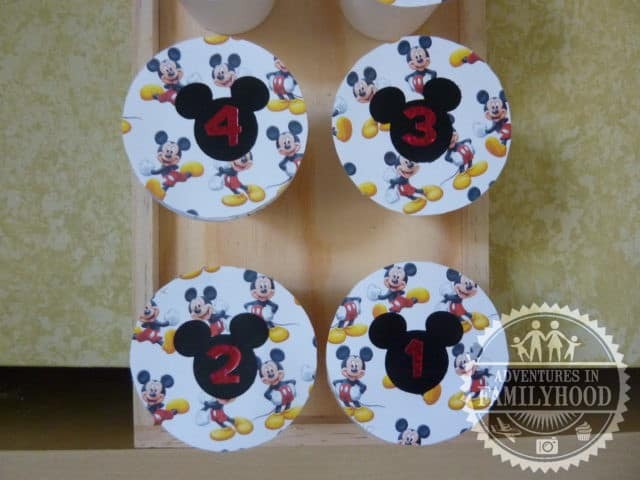 Assemble your cups on top of the wooden frame. Glue each cup to the wooden frame. On each day of the countdown, punch through the top of the cup and pull out the slip of paper. When you’re ready to start the countdown again, peel the rest of the circle off and repeat the steps above. Hopefully, using this countdown chart will make the days fly by. Your vacation will be here before you know it! Oh my goodness! This is one of the most creative things I’ve seen in a long time! ? Readers should feel free to print facts from my Blogorail stop to use with this too, if that would interest them. I love how versatile the countdown is! As a big coffee drinker, I was looking for something to make good use out of the used k-cups. It seemed like a waste to just throw them out. And yes, our countdowns, go together very nicely. This is an amazing idea! 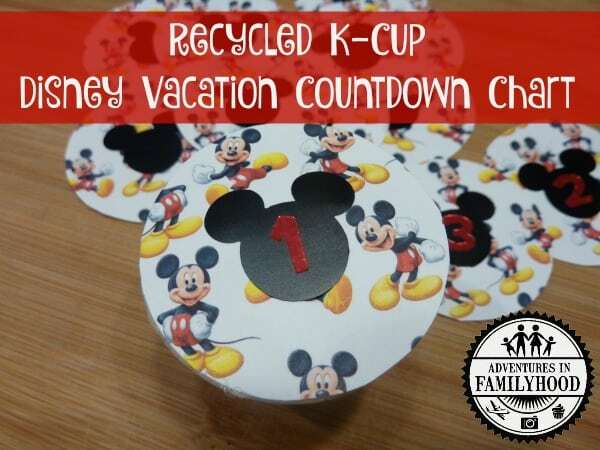 It’s a great way to recycle k-cups and I love that you can put facts and activities to get the whole family excited! What a fun interactive way to countdown to your next trip! I love that you include things for them to look forward to on the trip.